As much as I am happy admitting that I don’t follow football at all, it’s impossible not to be aware of the cultural significance that comes hand in hand with supporting particular teams in Glasgow. This awareness doesn’t necessitate understanding, so for this post I have decided just to report on all the various things that I noticed as a total novice, visiting the Ranger’s stadium for the experience more than anything else. I nearly made a very rookie error the other day; as far as this blog goes. 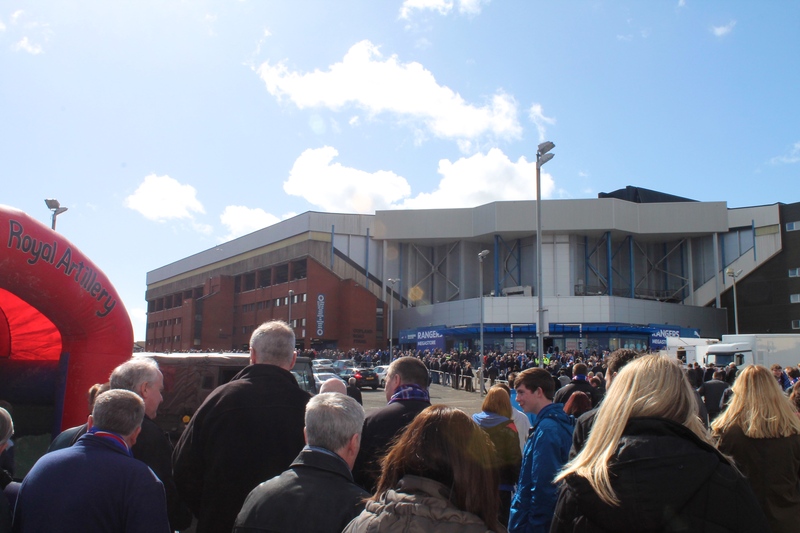 Upon being invited to go to a football match at Ibrox Stadium, I initially said no because I have zero interest in football and don’t expect to develop one any time soon. It would seem that I had totally forgotten that the very point of this site is to treat Glasgow the way I would any other city that I might visit as a tourist! The last time I attended any sort of sporting event was a baseball game in Canada. I suppose I expected to be fanatical about it because hey, I was in Canada and was fanatical about everything from corn dogs to maple syrup. It would seem that there is a food theme developing from my travel passions, so perhaps it was only to be expected that I spent most of the game fairly bored and striking up a relationship with a friendly banana (not an innuendo). To this day I couldn’t tell you what actually happened sports-wise during that game. But the banana was great. Anyway, I had a change of heart just in time, and made my way to the Southside on a sunny Sunday afternoon. Perhaps it’s testament to my limited understanding and appreciation of the beautiful game that I was so surprised to see the crowds. 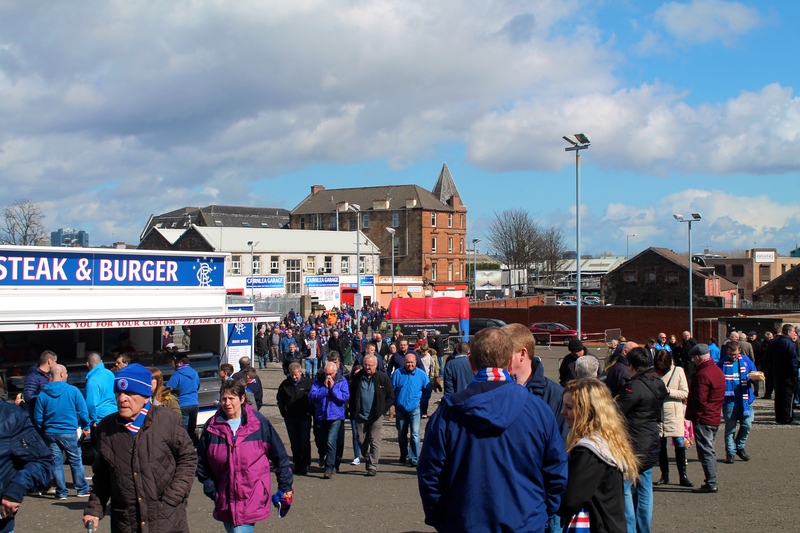 Rangers were up against Raith Rovers and the supporters were out in fairly impressive numbers. It took a fair bit of wandering around for us to figure out how to buy tickets and then locate the seats. The folks selling programs and souvenirs were very helpful in pointing us in the right direction, and it certainly seemed like we were in a distinct minority as we had no idea where we were going. The crowds may have been busy but everyone knew where they were heading and stopped only to say hello to various acquaintances along the way. Unfortunately I didn’t have any football fan pals (despite having made new friends with some elderly gentlemen on the crowded subway who were explaining their anticipations for the match) so we made our way to our seats just in time for the start of the match. When writing posts, I have found myself to be particularly interested in the old things. 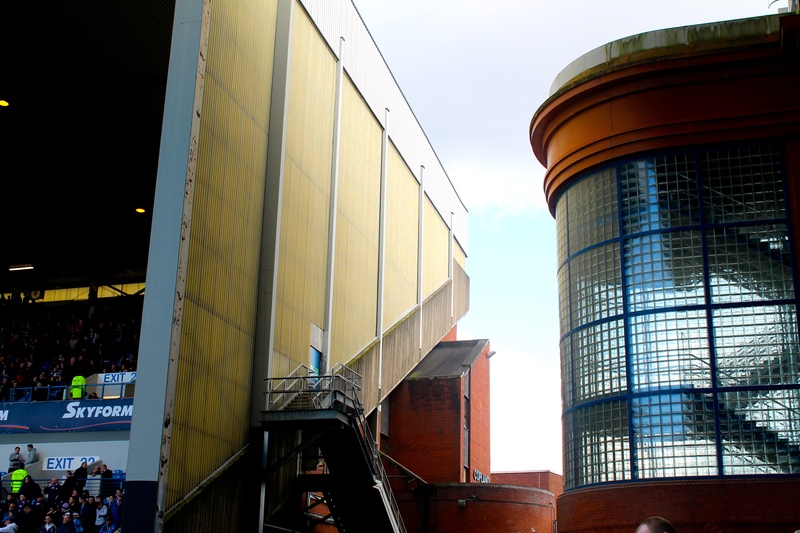 When I discovered that the stadium was first constructed in 1899, I spent a good 10 minutes daydreaming about how many goals had been celebrated, or how many people might have met their future partners at a game, and then I was rudely interrupted by lots of cheering because Rangers had scored the first goal of the match (for all those who hoped this article might be a football commentary, I apologise). From our seats in the East side of the stadium, it became abundantly clear that the preferred side of play was the sunny West side. The shadows cut the pitch in half and the players only rarely ventured over to our side where it was chilly. 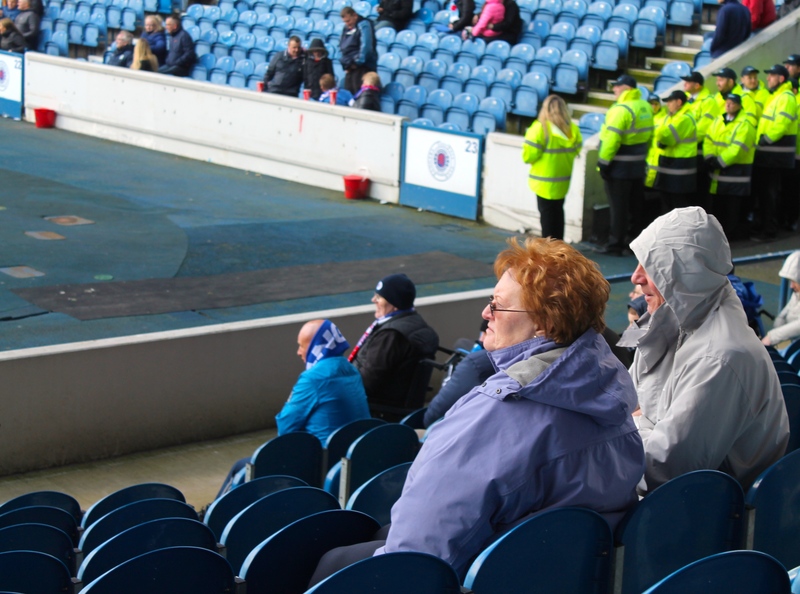 Perhaps this goes without saying, but if you do find yourself attending a football match, don’t forget to wrap up. 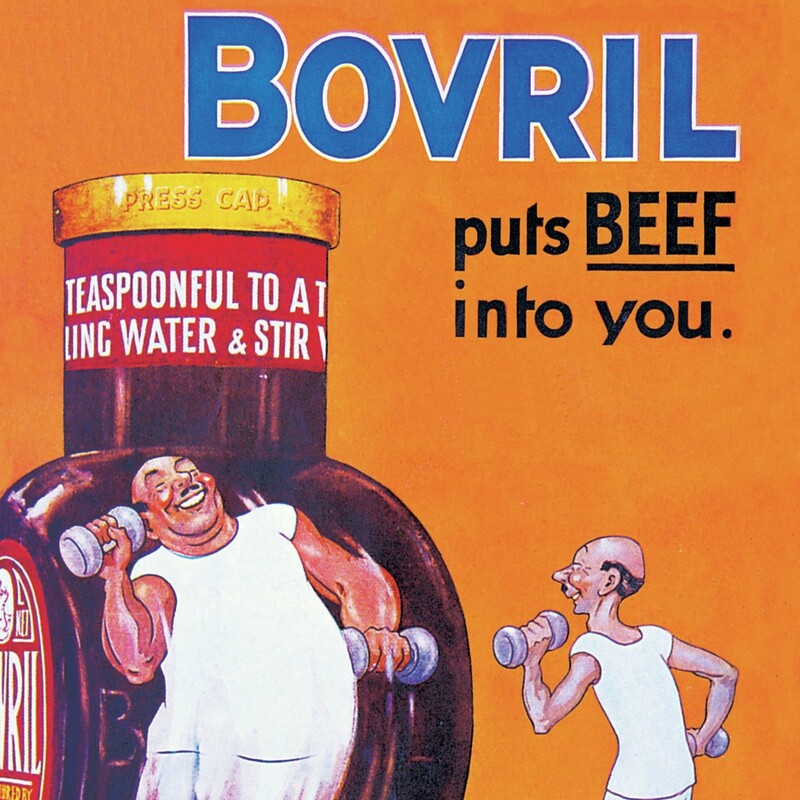 By the time half time rolled around, we were ready for a hot drink to warm up, and were very amused at the revelation that Bovril was one of the more popular options. It was then time for the second half, and I became more interested in looking around at the members of the crowd. A football fan friend of mine explained that a good football game has all the components you might expect of a good film – action, drama, suspense. As someone who regularly falls asleep at the cinema, this might explain my own personal lack of interest in football, but it goes a long way towards illustrating why it remains a huge part of many Glaswegians’ everyday lives. Aside from the interest in the game itself, it was clear that it is a hugely social, family event. Couples, fathers, mothers, sons, daughters, grandparents… it’s lovely to see how it brings people together. 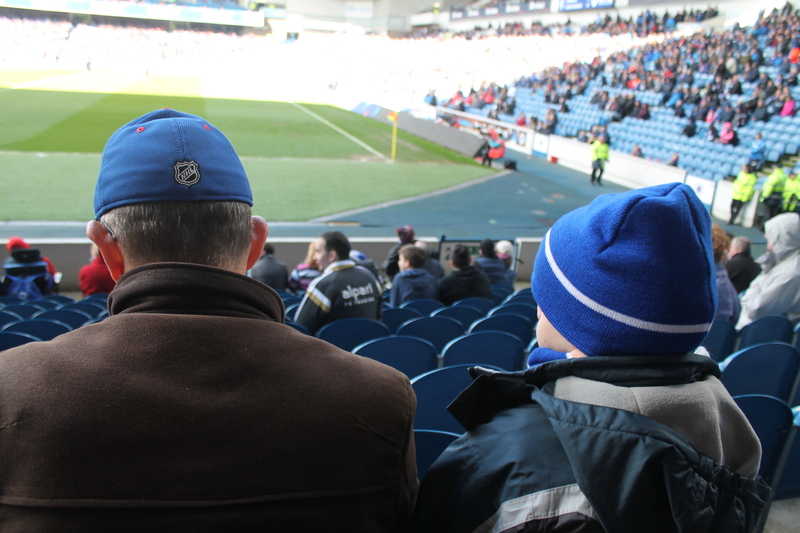 Even if I was struggling to follow the game at some points, there remained hundreds of things to see and contemplate. The goal celebrations were jubilant and as a part of the crowd, you were privy to a far more explicit and amusing commentary of the match than the one you usually get on the TV. Angry Glaswegian insults are amongst the greatest and most creative in the world, in my humble opinion. Another astonishment was the energy and motivation of a small group of supporters in the North end of the stadium who jumped up and down and cheered and sang NON STOP. They must have serious synchronisation and stamina training to be able to keep up that momentum for a full 90 minutes. I was very impressed. 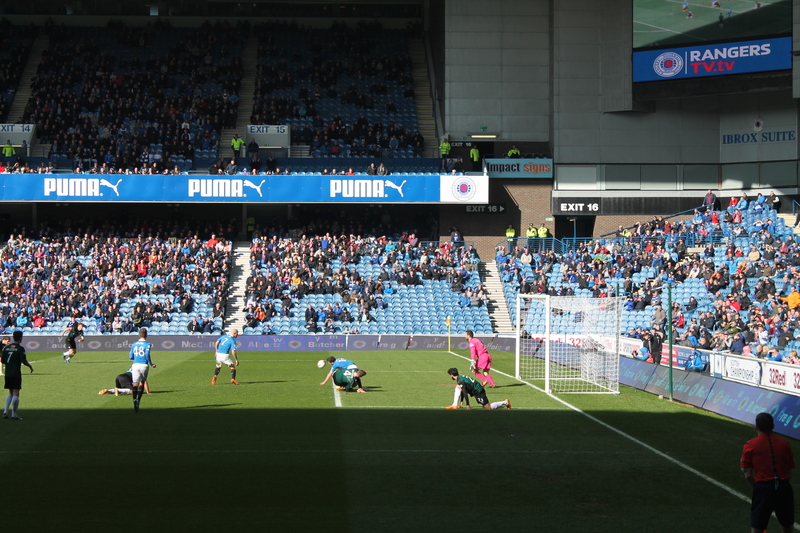 In the end, Rangers emerged victorious after an exciting few goals. Notice how all the action takes place in the sunny side? I think we’re onto something here. As we all filed out of the stadium, there was another eureka moment where I finally understood why the subway is such a shambles on match days. Wouldn’t it be funny if horses could go on the subway. 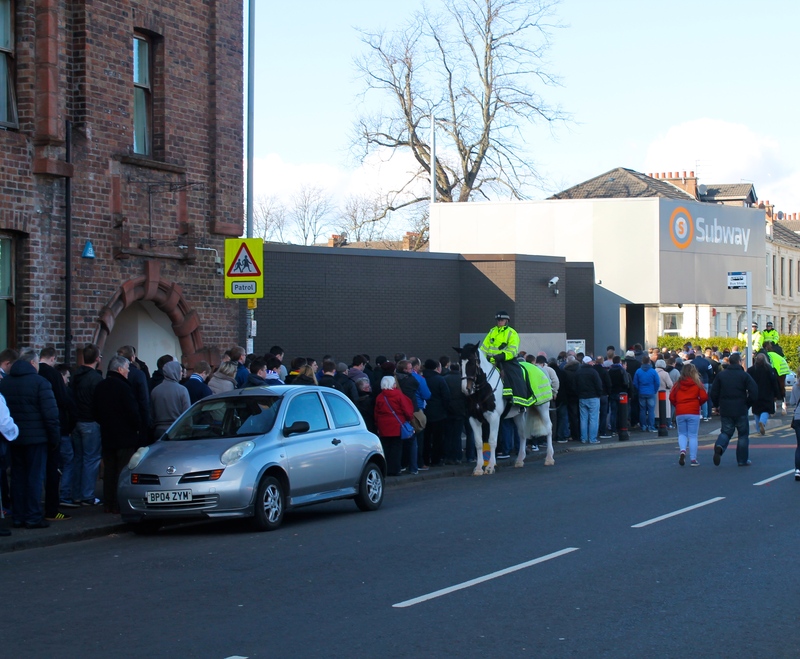 Believe me, that queue went a lot further than my camera lens could capture! As a result, we decided to walk home, across the Clyde to Partick which would have been more of a task had the weather not been so surprisingly great. All in all, the experience felt like a real Glasgow day out. If you want to take part in something where you can expect to be surrounded by locals, families and people with a real passion for the stadiums and teams that they have often grown up with, then I can recommend a day at the football. 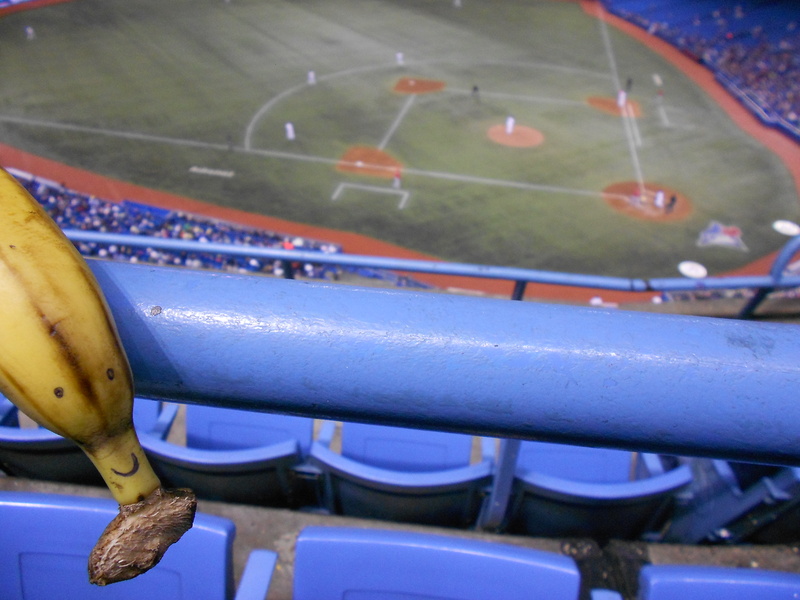 As for me, I’m not quite a converted superfan yet, but I managed to leave the friendly banana at home this time so that feels like real progress. Stay curious!